Remembering Elsie Quarterman –Paul Somers, Ph.D.
Not wanting to miss a chance to pay tribute to my friend, the 103+ year old Dr. Elsie Quarterman, I’m sitting down to reflect on my remembrances of this wonderful woman who befriended me and many other botanical and conservation colleagues. It was the summer of 1976 when I moved to Nashville to join the young staff of the Tennessee Heritage Program as its first botanist. The program, now well established with the State Department of Environment and Conservation, benefited greatly from the prior work of Dr. Quarterman (Elsie) and many of her graduate students at Vanderbilt University who had done vegetation and rare plant studies in the Central Basin of Tennessee. For help with understanding and conserving the best examples of cedar glades and their many endemic, nearly endemic, or otherwise rare Tennessee plant species, I and other colleagues frequently turned to Elsie and her former graduate students like Drs. Jerry and Carol Baskin, now faculty members at the University of Kentucky, for advice and assistance, and it was always generously given. Her work for the National Park Service identifying Middle Tennessee sites worthy of recognition as National Natural Landmarks and her many years of volunteer service for the Tennessee chapter of The Nature Conservancy were also valuable contributions to the conservation efforts in the region. More than an excellent ecologist, she was committed to putting her expertise and credibility to use in pursuit of conserving the natural landscapes that she and her students had studied, appreciated and recognized as threatened ecosystems and species. Whatever was needed, Elsie was there to help. I recall her helping me and Larry Smith, the programs first plant ecologist and natural areas administrator, identify some of the cedar glades in the Nashville Basin in need of protection. She was a participant in the statewide multi-agency Protection Planning meetings where actions were devised to further natural area protection and management. 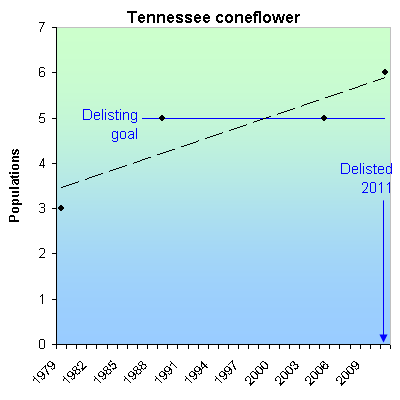 She was there when I needed advice while drafting the Recovery Plan for the once Federally Endangered Tennessee Coneflower, a species recently delisted after 30 years of recovery efforts. She was also there when Drs. Paul and Hazel Delcourt asked for Elsie’s help in locating wetlands in the Highland Rim and Central Basin regions where they could extract core samples for pollen analysis that would reveal the regions past vegetation. She provided some good recommendations and the rest is history— paleo-history of the Highland Rim. I recall Elsie laughing at herself after returning from one of her outings to a sampling site with the Delcourts. Apparently there was a wire fence to cross and while straddling it, Elsie was tossed to the ground, learning the hard way that it was electrified. Perhaps the time that I needed Elsie the most was when a proposed route for Interstate 840 was slated by the Tennessee Department of Transportation to go directly through a very significant cedar glade known as Sunnybell Glade, named as such because of its dense stands of a yellow-flowered member of the lily family commonly known as sunnybells. My initial meeting or two with officials at the Department of Transportation were cordial but resulted in no change to their plans, so I turned to friends in the media and within 24 hours Elsie was being interviewed by Nashville TV networks about the significance of the glade and its resources. Within another 24 hours, we learned that an alternative route would be considered, and soon, after some further planning and public hearings, the glade was spared. It is now a state-owned and managed natural area. Aside from her many contributions to ecology and conservation, I have to remark on Elsie as a person. She was obviously a woman ahead of her time—a person with great energy who worked harder than most. A tall woman, she stayed fit. I recall being in a Yoga class with Elsie when she was about 70. She was also a great fan of Vandy basketball. She is the kind of person who, when she speaks, commands trust and respect. She simultaneously displays intelligence, wisdom and charm. She could be hard-nosed, sticking to her guns, or compassionate. She was a southern lady who was not prejudicial toward anyone—a flower gardener, a lover of beauty, art, music, new recipes, and the company of good friends—many so much younger than herself. I’ll never forget the enjoyment of a couple of wonderfully informal yet elegant dinner parties hosted by Elsie at her home on Belmont Park Court in Nashville. Elsie’s friendship is one to cherish and something I will always remember. Thank you Elsie! This entry was posted in Botany, Cedar glade, Elsie, History, Okra Paradise Farms, Plants and tagged Botany, Brown Dog, Cedar glade, Ecology, Elsie, Georgia, Gretchen Quarterman, History, John S. Quarterman, Lowndes County, Massachusetts, Nature Conservancy, Okra Paradise Farms, Paul Somers, Plants, Tennessee, Tennessee Coneflower, Yellow Dog on June 25, 2014 by John S. Quarterman.